Montana DNRC helicopter used to fight wildfires. Montana's 2018 Fire Season Costs Trending Well Below Average. Montana’s wildfire season is slowing down and trending well below average in the number of fires, acres burned and cost to the state. The forecast of the state’s 2018 fire bill is only a sliver of the cost of last year’s historic fire season, according to a report from legislative researchers published Wednesday. John Tubbs, the director of the Department of Natural Resources and Conservation, knocked on a wooden podium last week when he briefed state lawmakers on the cost of managing fires this year. If that’s the case, it would put Montana significantly under the more than $20 million average cost to the state per fire season over the last decade. 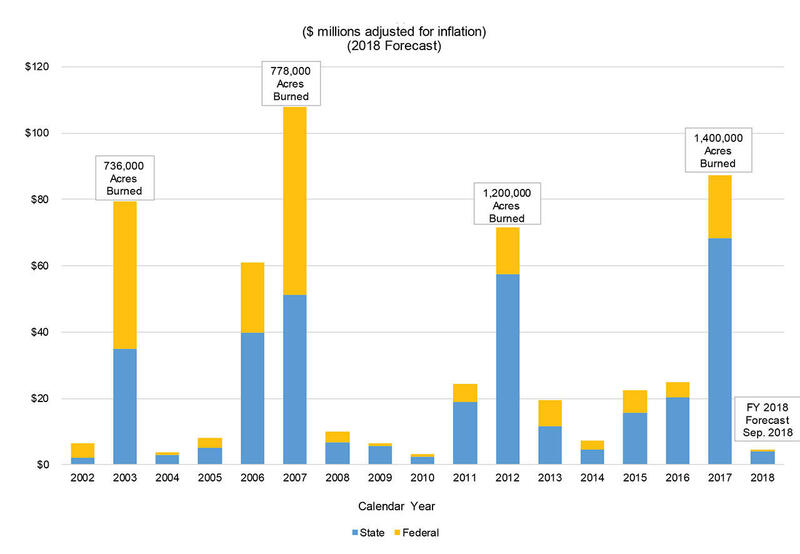 Annual Montana fire suppression costs. The cost of firefighting last year, around $70 million, played a role in the derailing of the state’s budget leading to a Special Legislative Session and sweeping cuts across state agencies. As of early September just over 74,000 acres had burned in Montana. This time last year that number was 1.2 million. It’s a relief to Montana's firefighting savings account, which remained drained from the 2017 season heading into this year. DNRC estimates the fire fund balance was around $5 million at the end of August. Officials add that fire season is still active and the state’s final costs for this year’s fire season are still unknown. CORRECTION: An earlier version of this story's headline included an incorrect total for the current costs of Montana's 2018 fire season. All Stage 1 and Stage 2 fire restrictions have been lifted across northwest Montana. Put simply, that means campfires and outdoor smoking is allowed again. Restrictions have also been lifted on operating equipment. The State’s fire fighting savings account started this month with the second lowest balance since it was created a decade ago. There’s only about $4 million in the fund’s reserves for this fire season. That’s about a fifth of what the state needs to cover an average fire season bill.